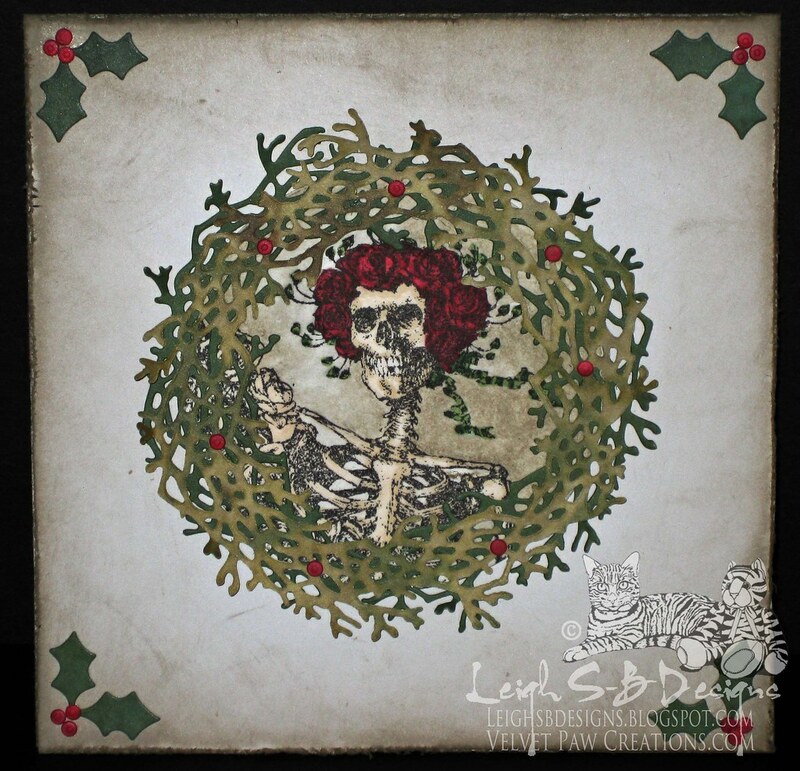 Velvet Paw Creations: Day 8: 12 Days of Creepmas with Smeared & Smudged! Day 8: 12 Days of Creepmas with Smeared & Smudged! I'm embracing my darker side this year and participating in Smeared and Smudged forum's annual 12 Days of Creepmas blog hop as a Jolly Blogger! Here's my card for today! Here's a closer look at the details. You'll notice I bent up some of the sprigs on the wreath to add some dimension. I started out by stamping the Skeleton and Roses image with Tuxedo Black Memento Ink onto Neenah Solar White cardstock and die cut it out with a Spellbinders Circle die. The roses and skeleton were coloured with Copic Sketch markers: E0000, E41, G24, G28, R39, R46 and the Colourless Blender. For the background I used Umber Derwent Pastel pencil and blended it with a Dove Blender pen. The wreath was die cut out twice from a sheet of Tim's Retro Grunge cardstock. The cardstock is double sided with one side a darker greenish wood grain pattern and the other a mottled green star design. I love the multi-tone effect the overlapping wreaths create. The holly and berries are part of the same IO die and I die cut out the holly from the wood grain side of the cardstock and coloured a scrap piece of Neenah cardstock with red Copics and die cut out a few berries. I then made a square folded card from white cardstock and roughened up the edges with Tim's paper distresser tool and applied Pumice Stone Distress ink to the edges. Everything was adhered to the card wtih Scotch Quick Dry Adhesive. Simon Says Stamps Challenge - What's Your Favourite? Thanks for stopping by and enjoy the rest of your hop! Awesome creation! I love your skeleton! 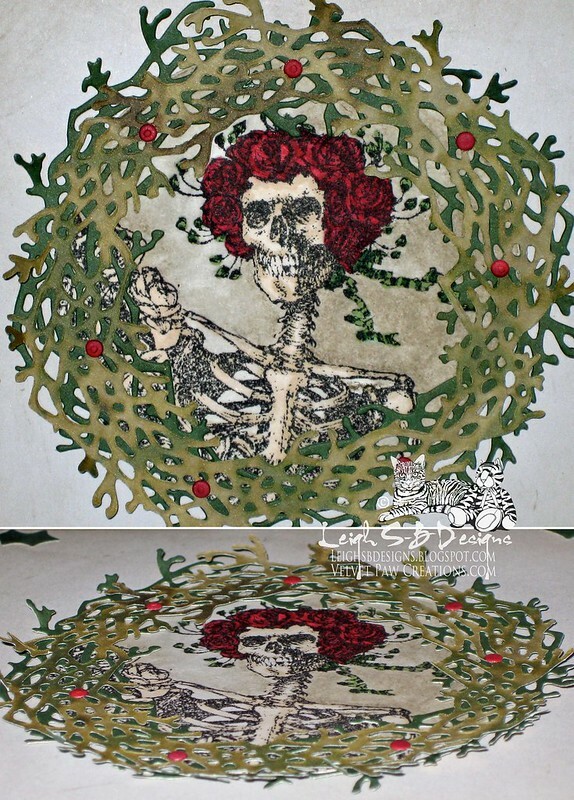 I really adore this..the wreath is awesome and so versatile and of course that skelly rocks! Great card Leigh! I absolutely love that stamp and how you brought it to life! Awesome creativity! This is a fabulous wreath I love the inks and the coloring. Congrats on your newa with Lost Coast Designs..you deserve the best! I just want to say how awesome your project is again and thank you for playing with us at smudgy antics. Beautiful card, love the coloring on the skellie and it's so cool how the wreath turned out. Congrats on making the DT at LCD - that's awesome. Wonderful creation! Thanks for joining us at Forever Night Creepy Challenges. I love this piece it is brilliant. Thanks for sharing your art with us at poisoned peas please. What a fun and beautiful creation. Thanks for joining us at Poisoned Peas Please. Christmas Robin DominoART Tree Ornament!